Teresa Maria, Politburo member of the Communist Party of Cuba, affirmed that the FMC will work closely with the Vietnam Women’s Union (VWU) in implementing agreements at all levels, reinforcing the special solidarity between the two countries. She congratulated Vietnam on the significant achievements it has made in recent times. 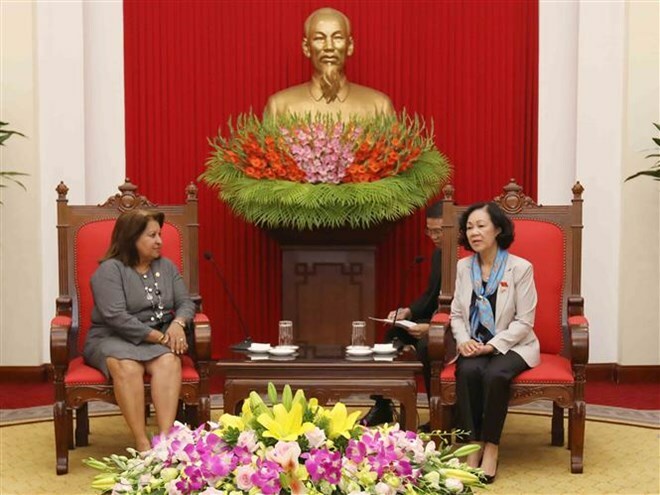 Teresa Maria thanked Vietnam for its great support for Cuban people, particularly women, expressing her belief that under the leadership of the CPV, Vietnamese people will gain even greater achievements in the national renewal process. Welcoming the Cuban guests, Mai, who is Politburo member and Secretary of the CPV Central Committee, asserted the consistent stance of the Party, State, and people of Vietnam towards supporting the revolutionary cause of the Cuban people. She appreciated the delegation’s visit, as well as the increasingly close friendship and recent cooperation between the VWU and FMC. While highlighting the time-honoured solidarity and friendship, Mai, who is also President of the Vietnam-Cuba Friendship Association, said this is a valuable asset of the two Parties and states. She also conveyed her pleasure at Cuba’s success in the process of updating its socio-economic model, believing that Cuba will overcome its difficulties and challenges to further promote the national development. Regarding the implementation of gender equality goals, the Vietnamese official said Vietnam has learned much from Cuba’s experience in this field, adding that it is very valuable to Vietnam.